Silkgut® - distributed by Bow Brand for Aquila Corde Armoniche - is a synthetic string available from 1st C - 5th C.
These strings are can be used on Salvi lever harps such as the Mia, Titan, Hermes and Una. 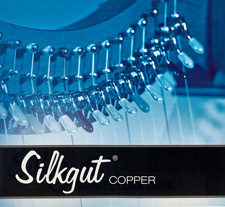 Silkgut® Copper strings - distributed by Bow Brand for Aquila Corde Armoniche - contain copper powder from 4th octave B to 5th octave D to remove any musical "jump” from wire to non-wire strings, and lend to the Una Deluxe’s indulgence of rich tones and deep bass. These strings are can be used on Salvi lever harps such as the Una. They could be another good alterntive to gut strings for vegans or those experiencing frequent string breakages on gut strung lever harps.